Obsolete: Scum-watch: "Britain at night is more dangerous than Iraq." Scum-watch: "Britain at night is more dangerous than Iraq." A HERO paratrooper attacked with an iron bar as he went to buy a pizza last night branded Broken Britain "more dangerous than Iraq". The victim said: "At least in Iraq you know who the enemy is. Over here it can be anyone. I genuinely believe that when you go out at night over here its more dangerous than Iraq." Quite so. By the lowest estimate, since the 2003 invasion 150,000 Iraqis have died in violent circumstances, with the numbers injured incalculable. By contrast, the murder rate in the UK stubbornly sticks in the region of the mid 700s, or at least has done now for quite some time. It's one thing to sympathise with the man because he's just suffered an horrific attack, but nonetheless point out he couldn't be more wrong by mentioning the actual figures, but the Sun hasn't bothered to do that. It's instead currently collating more or less all the violent incidents it can get hold of, without deigning to mention such things are by their nature incredibly rare, and might happen in a certain area once without anything untoward then happening for years. Like with previous campaigns, absolutely any evidence will do to try and prove the overall point, that Britain is a broken society, even if everything suggests that this is just another scare campaign meant to send a message to politicians while selling newspapers. 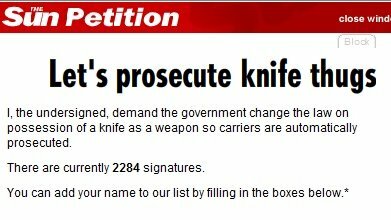 Speaking of which, the Sun has launched another glorious petition crusade, demanding that the government make knife possession an offence that leads to an automatic prosecution. It's a great success so far - a whole 2,284 people have currently signed up. How could Gordon Brown possibly resist when such force is behind the cause? I particularly like the way the paper's response to an incident involving a man being attacked with an iron bar involves a petition to make it an offence to carry knives. After all, if the knives were off the streets, the thug wouldn't have his iron bar to...er...hang on. Of bank holidays, churnalism, and tax cuts. Giving a message to Hazel Blears. Don't panic, but he might be Islamic! The final words on Dorries (for now).